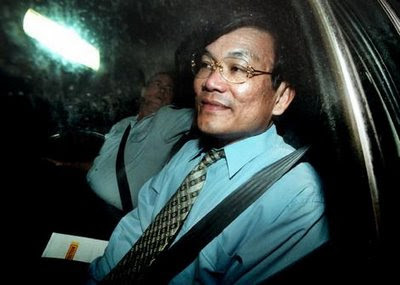 The inquiry into the conviction of Phuong Ngo - the man jailed for masterminding Australia's first political assassination - will focus on the way the police and the Crown dealt with two Vietnamese witnesses and whether that had an impact on their reliability at the trial. In a dramatic development, the case has recently been reopened by the Chief Justice of the NSW Supreme Court, James Spigelman. David Patten, a retired District Court judge appointed to conduct a judicial review of Ngo's conviction for the murder of MP John Newman, said today that he wanted to hear from "police and NSW Crime Commission officers who were involved in the recorded interviews with [the two witnesses]". He also wants to hear from Ngo and from the case officer at Ngo's trial, the now NSW Deputy Police Commissioner, Nick Kaldas. According to a draft of "suggested issues" released today, Mr Patten will have to decide whether the reliability of the two witnesses was "interdependent in a manner not disclosed by the Crown to Mr Ngo and, if so, whether such interdependence undermined their reliability". He will also have to decide whether the evidence those witnesses gave before Judge Stephen Norrish at a District Court trial in 2003 undermined their evidence in the Ngo trial. Mr Newman was killed outside his home at Cabramatta on September 5, 1994. Ngo was convicted of his murder in June 2001 and sentenced to life imprisonment. The case was reopened by Justice Spigelman on the basis of a report by an academic from the Australian National University, Hugh Selby. Mr Selby drew on a report by Professor Reg Coutts, from the University of Adelaide, casting doubt on Crown mobile phone evidence. Mr Hastings said today that Professor Coutts was available to make further inquiries, and appeared to be ready to start straight away, but he needed to be told the extent to which he needed to inquire further. The issues to be considered in the inquiry include the extent to which mobile telephone records tendered in the trial provided satisfactory evidence as to the whereabouts of Ngo, and whether those records were "consistent or inconsistent with the Crown case". Mr Patten will have to decide whether the Crown "frankly and fully disclosed to Mr Ngo the circumstances which led to the finding of a firearm in the Georges River at Voyager Point and, if not, whether such omission potentially impacted upon the trial". He will also have to decide whether the Crown failed to disclose to Ngo the existence of a record of interview between the then Inspector Kaldas and former Fairfield councillor Albert Ranse on May 28, 1999, and to what extent that failure, if it occurred, impacted on the trial. Mr Patten granted an adjournment until 11am next Wednesday so the issue can be resolved on whether Ngo is to get legal aid, and he ordered that Ngo be brought from Goulburn jail [solitary confinement] to the court complex that day to confer with Mr Hastings.